Summary: These Cooperative Agreements, part of the larger OAH TPP Initiative, will support medically accurate and age appropriate programs that reduce teen pregnancy. Funding is available for two broad program types: 1) curriculum-based programs that seek to educate young people about topics such as responsible behavior, relationships, and pregnancy prevention, and 2) youth development programs that seek to reduce teenage pregnancy and a variety of risky behaviors through a broad range of approaches. Youth development programs usually incorporate multiple components, such as service learning, academic support, or opportunities to participate in sports or the arts. They also collaborate with multiple networks and /or provide youth with development focused activities. In both cases, funding under this announcement can only be provided to applicants who seek to replicate evidence-based programs that have been shown to reduce teenage pregnancy, behavioral risk factors underlying teenage pregnancy, or other associated risk factors. 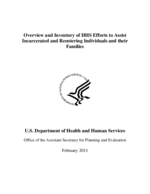 Under a contract with HHS, Mathematica Policy Research (MPR) conducted an independent, systematic review of the evidence-based programs shown to be effective in preventing teenage pregnancy. The review defined the criteria for quality of an evaluation study and the strength of evidence for a particular intervention. Once completed, the study identified twenty-eight (28) evidence-based programs to be replicated. Out of the twenty-eight, two of the program models eligible for replication target populations that focus on adjudicated youth and/or youth in detention settings. HIV Risk Reduction Among Detained Adolescents – This program model targets high risk adolescents in juvenile detention facilities. Participants attend single three-hour small group sessions that include group activities and video presentations. Following the three-hour session, participants engage in one-hour group discussion on alcohol use and sexual activity using motivational enhancement therapy techniques. Rikers Health Advocacy Program – This program model targets high-risk youth, particularly drug users and youth in correctional facilities. Participants attend four one-hour sessions on HIV/AIDS prevention. Background: The purpose of the Teen Pregnancy Prevention initiative – Tier 1, funded by the Consolidated Appropriations Act, 2010 (Public Law 111-117), Division D, Title II of the Act , is to support the replication of evidence-based program models that have been proven through rigorous evaluation to be effective in preventing teenage pregnancy. Funds were made available for projects operating in one or multiple sites with an emphasis on replication of evidence-based models that have demonstrated impact on key sexual behavioral outcomes. Teen Pregnancy Prevention Tier 1 sought to fund programs that will increase the capacity of communities to implement and evaluate evidence-based interventions to prevent teenage pregnancy. Communities with high rates of teenage pregnancies were targeted. On September 30, 2010, OAH funded a broad range of evidence-based program models. Having multiple funding ranges allowed a wide array of evidence-based programs to be funded by a diverse set of grantees that have varying capacity to implement large-scale or smaller scale projects. The YMCA of Metropolitan Detroit is implementing the Making a Difference! model to address the need for teen pregnancy prevention and STI prevention for youth ages 11-14 in Wayne, Macomb, and Oakland Counties. Approximately 10,000 youth will be served over the five-year project. During the summer months, the program will be offered to youth via YMCA branches and other youth serving organizations. Incarcerated youth at two detention centers will also being served through this project. San Diego Youth Services (SDYS) is the lead agency of a 5-part collaborative effort that will implement the CAT + Project (Community Assessment Team). They will add Reducing the Risk to the existing CAT project as an enhancement. The collaborative that operates the CAT project is an established collaborative that has worked together on the CAT project (juvenile justice and life skills) and VAM (Vision Achievement Mentoring- teen pregnancy prevention). SDYS will serve 2,160 youth per year with the CAT + Project. The target population is youth ages 13-19, males and females, who are involved in the juvenile justice system or have been identified as high risk. The YMCA of Cumberland Maryland will implement Project AIM for middle school students in rural Allegany County, Maryland. The project will be implemented in four public middle schools, one private middle school, the Girls’ Group Home, and the Parenting and Pregnant Teens Program, reaching a total of 750 youth each year. In addition, the grantee will implement Project AIM with 40 highly at-risk youth each year who will be recruited from foster care, homeless shelters, and juvenile probation officers. The project anticipates success in redirecting the aspirations of the targeted youth away from risky sexual behaviors and toward positive life goals. The Southern Nevada Health District (SNHD) will work with a core group of agencies such as the Clark County Division of Family Services, the Nevada Division of Child and Family Services, and the Clark County Family Courts to provide education and interventions for 9,000 high risk adolescents aged 13-18 years in seven zip codes. Youth will be served in detention centers or at one of two Division of Family Services sites. The initial project will serve youth in the Clark County Juvenile Detention Center, Clark County Probation, and Division of Family Services Foster Care Program. In year three, SNHD plans to expand to community-based organizations (i.e., Boys and Girls Clubs) to reach youth that reside in Clark County zip codes with high incidences of teen birth rates, HIV/STD infections and poverty, and disenfranchised youth (including immigrants, homeless and those involved with the judicial system). This project targets high risk youth aged 12-19 years over 5-year project period. Youth in the target population are located six public housing communities, three detention centers, and five programs at Youth Services Tulsa, including adolescent emergency shelter, street outreach, first time offender, home-based counseling, and transitional living program. Evaluation Activities: OAH plans for a mixture of evaluation strategies to address the question of whether replications of evidence-based programs are effective. The evaluation strategies include: (a) Federal evaluation of a selected subgroup of all grantees and (b) grantee-level evaluations (with Federal training, technical assistance, and oversight) for projects funded in Ranges C and D. In addition, all grantees will be expected to monitor and report on program implementation and outcomes through performance measures. Performance measures are intended for monitoring purposes and to provide feedback to programs about whether they are implementing programs as intended and seeing outcomes as expected. Summary: The Office of Adolescent Health (OAH) and the Administration on Children, Youth and Families (ACYF) collaborated in funding competitive discretionary grants under two similar programs to support innovative youth pregnancy prevention strategies which are medially accurate and age appropriate. This single application process was developed to link the two programs which share a common goal and to help reduce the application burden on potential applicants by eliminating the need either to determine which program to apply for or to submit two applications. TPP and PREP - Tier 2 is part of the larger OAH TPP Initiative which will support research and demonstration programs that will develop, replicate, refine, and test additional models and innovative strategies for preventing teenage pregnancy under the TPP program, and to implement innovative strategies for preventing teenage pregnancy and target services to identified populations under PREP. These populations include high-risk, vulnerable, and culturally under-represented youth populations, including youth in foster care, homeless youth, youth with HIV/AIDS, pregnant women or mothers who are under 21 years of age and their partners, and youth residing in areas with high birth rates for youth. Background: The purpose of the Teen Pregnancy Prevention Initiative – Tier 2, funded by the Consolidated Appropriations Act, 2010 (Public Law 111-117), Division D, Title II of the Act, is to support research and demonstration grants to develop, replicate, refine and test additional models and innovative strategies for preventing teenage pregnancy. Programs funded demonstrate that they can carefully document the intervention for possible replication by others, demonstrate the capacity to conduct a process and outcome evaluation, and plan for the dissemination of findings through various means, including but not limited to, publication of an article in a peer-reviewed journal. Funded projects are expected to address teenage pregnancy prevention and related risk behaviors in youth in communities with high need as demonstrated by high rates of teen birth or pregnancies or other associated sexual risk behaviors. This program aims to increase the capacity of communities to develop, implement, and evaluate interventions for dissemination and replication by others. Funded projects must show that the proposed intervention is (a) based on some preliminary evidence as effectiveness, (b) a significant adaptation of an evidence-based program, or (c) is a new and innovative approach to teenage pregnancy prevention. The State of Alaska, Division of Public Health, Section of Women’s, Children’s, and Family Health will implement a Making Proud Choices! adaptation using trained peer health educators. The project will target youth ages 11-19, in five communities: Anchorage, the Matanuska-Susitna Valley, the Kenai Peninsula Borough, Kotzebue, and Bethel. Participants will be drawn from behavioral health residential facilities, alternative high schools, juvenile detention centers, foster care, and transitional housing; additionally, the project will serve Alaska Native youth living in rural areas that experience high teen pregnancy rates.